If you've ever been to an outdoor art festival, you know what the typical food fare is: greasy, warm, prepared in large quantities, and expensive. Definitely not really good eats. Well, that is about to change. A great new concept for food at an outdoor arts festival is being introduced this coming weekend at the St. John's River Festival of the Arts. It is called the Culinary Arts Court. Say goodbye to normal carnival food and hello to fine food representing several various cuisines/areas, and various craft beers as well--an added bonus. The Culinary Arts Court will feature cuisine from France, as well as several areas from the US including Maine, Hawaii, and the Southwest. And they won't just be serving fine foods, wine, and craft beers, but you'll be able to see demonstrations as well. If you read my blog regularly, you'll know that I am a big fan of downtown Sanford. I am happy to report that I, the Lake Mary Food Critic, have signed up to be a patron for this worthy endeavor, and my friend and partner is one of the featured artists. I seriously hope you will come to downtown Sanford May 5-6 to see what this is all about. And, after the festival, come back here to see what I have to say about the food--you know I'll be writing about it. Hope to see you there, The St. John's River Festival of the Arts, May 5-6, in historic downtown Sanford. We had an OK dinner at Caffé Venice Pizzeria & Ristorante recently, though it was not our original intent to eat there. We walked in on a Saturday night expecting to see our favorite waitress, but the faces in the restaurant were unfamliar. It seems the the former Caffe Positano owners sold their business and now it's called Caffé Venice Pizzeria & Ristorante--though it took 3 months to put a new name on the marquee. Well, we decided to give it a try. This is a mixed review, some good, some not so good. But you can go and decide for yourself. Our waiter, Stephen, was very competent and attentive, giving good service and answering all our questions. After getting over our initial shock, we started with some wine and ordered an appetizer, the mozzarella sticks. They were pretty ordinary, run-of-the-mill mozzarella sticks, though the marinara was pretty good. They were tasty enough, but I could have gotten the same things at many bars and much cheaper restaurants. 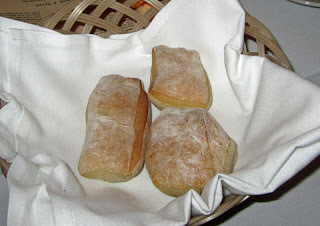 We also had some bread come out, along with some olive oil for dipping. The bread, too, was just OK. It was nothing too special and did not seem to be homemade--rather my guess is that it came in frozen and they bake it there. Still, it was OK. It was nice that they brought bread and we didn't need to request it--I hate when that happens. We started our dinners with a salad. I had the Italian dressing. It came already dressed and, for my taste, just a bit over dressed--but that's on me for not asking for the dressing on the side. It was a pretty standard salad with some carrots, red cabbage, a bit of tomato, romaine, etc. All that a decent salad should be. 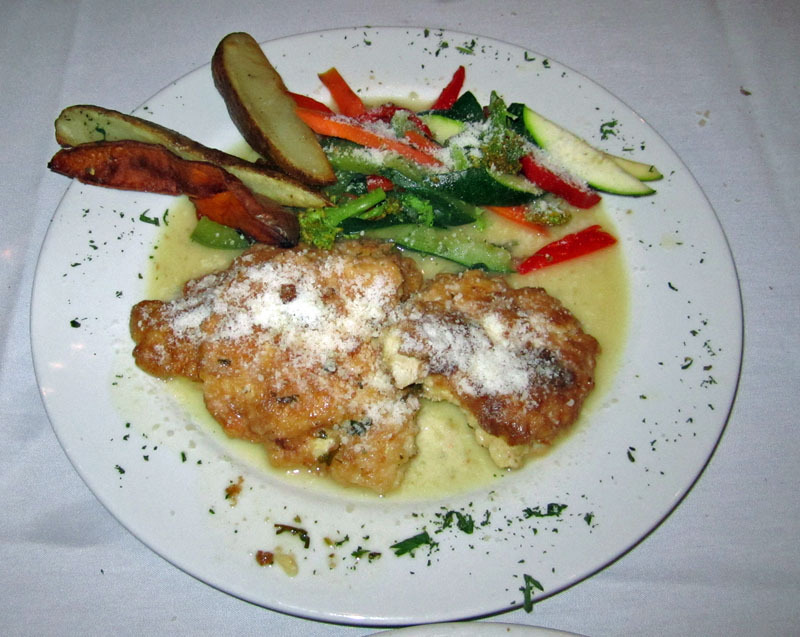 For his main course Tommy had the Chicken Francais, chicken that was battered and lightly sauteed in a white wine and lemon cream sauce. I'll have to say, the chicken itself was very very tender. Perhaps just a bit over brined (a tad bit salty), but nonetheless, it was very good. The lemon of the sauce was just a bit overpowering, but still it was a very good dish. It was served with some mixed vegetables and potatoes on the side. These too were very good, and cooked properly. Overall, this was a very good dish and Tommy loved it a lot, as did i when i tasted it. For my main course I chose a special of the day, as recommended by our waiter, it was home-made ravioli stuffed with chicken, spinach, and cheese. 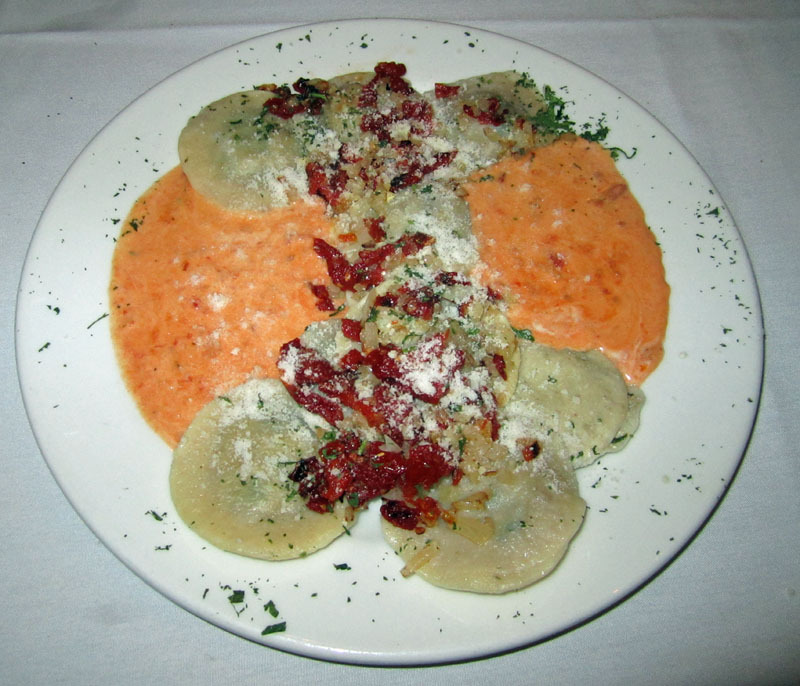 The presentation was a bit "red" for me, the ravioli were surrounded by a vodka cream sauce and topped with some sun dried tomatoes. Unfortunately, the home-made ravioli were quite tough. I mean, the pasta part of them was very tough. I wonder if they taste their own food when the cook it. The flavors were pretty good, but it was hard to get past the tough pasta to really enjoy the dish. I was disappointed in this dish. Overall, our experience was just "OK." I think we were a bit shocked to find our favorite Italian restaurant gone, and I know I was disappointed in the homemade ravioli, though everything else was OK. I guess I'll give it a "like" vote on urbanspoon.com, but only by a little, and only because I like to support local businesses. I reserve the right to return and, if need be, change my vote. But I suggest you give it a try and see for yourself! A new Pizza/Italian place opened in the area recently, and Tommy and I went to visit Chianti's Pizza & Pasta on a recent rainy evening. If my first experience is any indication, we'll be back here again--and soon. I will give you a hint: it was a good experience from top to bottom, great Italian food, and close to home! It was raining cats and dogs when we arrived, but we found a front row parking spot and someone was waiting for us, holding the door. A nice and welcoming touch. There were not many other tables taken, just a few, but then again, it was pouring out. Later on as the rain subsided more diners came. No matter, we were promptly greeted, seated and provided with menus. We had a coupon for a free bottle of Chianti with our meal, and it was quickly produced. We were in the restaurant only a few minutes when the chef/owner, Ian, stopped by to chat. Being the food nerd I am, I had lots of questions and he was gracious with his time, several times, during the course of our meal. Chianti open and poured, we ordered appetizers. 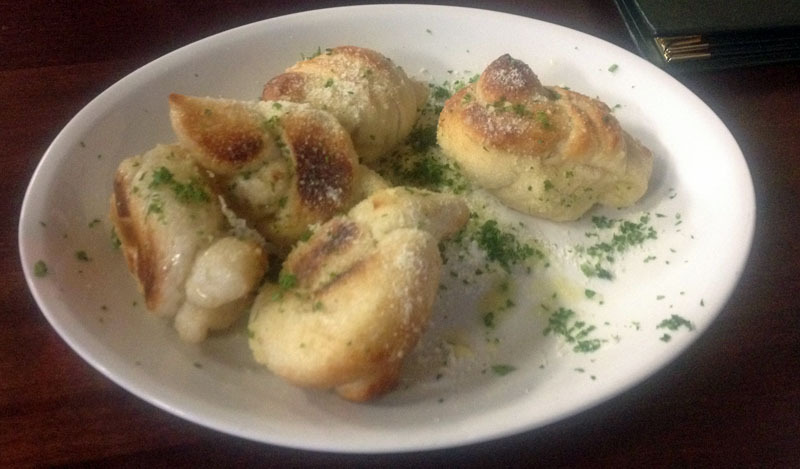 But while we were waiting for them, we were given an order of Garlic Knots, gratis. It's just what they do, how nice. And.... Wow! They were right up there with the best garlic knots I've ever had. They were nice and yeasty, warm, sprinkled with parmesan and parsley and with a nice moderate garlic flavor. Tommy is not a big garlic fan, and we had some elsewhere that he didn't like. These he loved since the garlic was not overpowering. I'd have to agree, they were excellent. For our first appetizer we had the Mozarella Fritta. This was whole milk mozzarella that was lightly battered/breaded and fried. 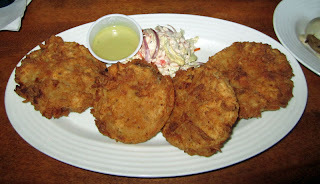 It was served with the house (home-made) marinara sauce, and they were dusted with parmesan and parsley. This was a home run. 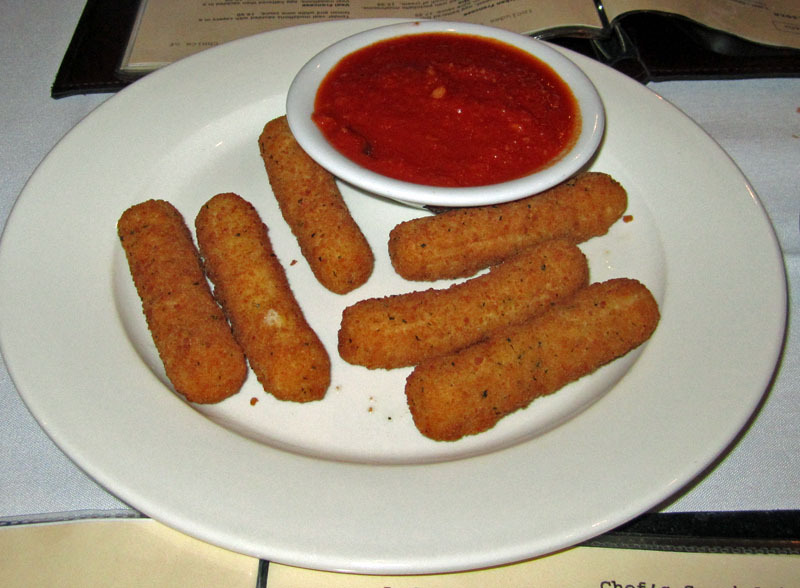 So many so-called "Italian" restaurants serve your "Sam's Club" variety of mozzarella sticks as an appetizer. 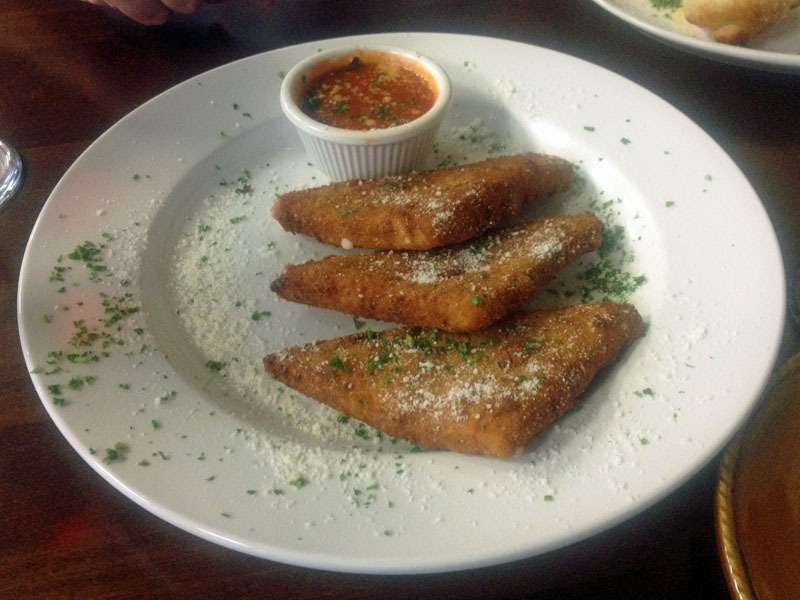 But these were truly outstanding, among the two best I've ever had (the other was recently at Marco Dino's another Sanford Italian place). The mozzarella was smooth and creamy and ooey-gooey, the crust of the batter gave a nice texture and contrast to the creamy chesse. And the marinara? It was very good and not overly sweet, just a nice, pleasant marinara. For our other appetizer we ordered a small Pepperoni Pizza--I wanted to see what they could produce from their brick oven. Again, I was not disappointed. It came out nice and hot and was filled with cheese and a big cheese flavor. Wow, I will be back just for pizza. Chef Ian later told us that they have a daily lunch special with a small pizza and a drink for somewhere around $7, If I remember correctly. Gonna bring my "work gang" here sometime soon with a deal like that. But back to the pizza--it was wonderful, lots of big cheese flavor, nice sharp pepperonie, and a nice thin crust--cooked perfectly. Best of all, we have leftovers so will have some again later today. 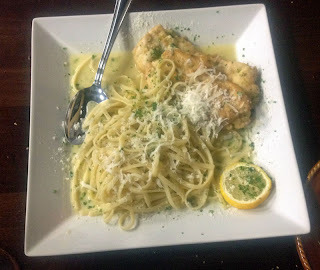 For his main course, Tommy chose the Chicken Francese--lightly battered and fried chicken medallions served over linguini and smothered with a lemon butter sauce. First a word about the sauce--the lemon was very light which was a good thing. In some restaurants, the lemon overpowers the sauce. Here the touch was light, but there was some lemon on the plate if you wanted more. I had quite a good taste of the sauce and loved its buttery goodness with just that hint of lemon. And the chicken--well, it was absolutely tender and delicious. And the linguini was prepared to perfection, just al dente. It was a very good dish. Every bite was a wonderful reward for the mouth. For my main course, I had the Zita ala Vodka--al dente rigatoni that was sauteed in SKY vodka sauce and topped with some pancetta and more cheese. It was wonderful, piping hot and full of good hearty italian flavor. 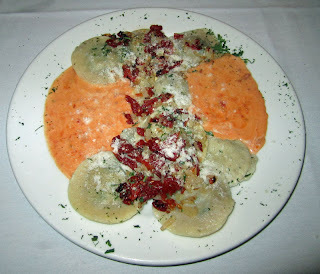 The vodka sauce was nice and light, not overly creamed with milk. The pancetta was finely julienned. The baking melded all the flavors together. I love this dish and the portion was more than ample--I have a nice sized portion leftover for later today. 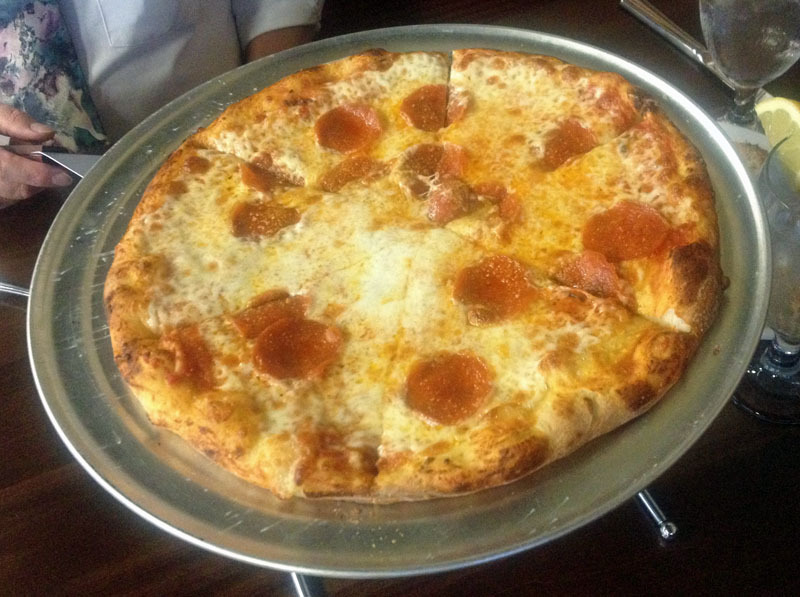 Our experience at Chianti's was top notch. The food and flavors were great. The atmosphere is more modern and open and pizza joint-ish, but the food that we had was right up there with the best Italian food I've had. With the closing or ownership change of Caffe Positano, I may have a new favorite Italian Restaurant--or maybe two. Between Chianti's and Marco Dino's, both in Sanford, it's a hard decision. But I know for sure I'll be back to Chianti's. The restaurant business is hard, but the food and experience here was top notch and it was a good value with very reasonable prices. I suggest you give Chianti's a try and let me know what you think. Ask for Ian, and tell him that the Lake Mary Food Critic sent you! Enjoy! 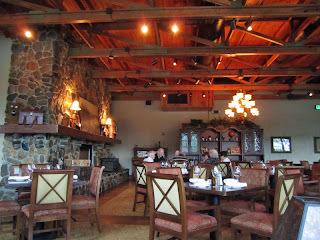 I'll say this about our experience at Monroe's at Route 46 the other night: the food was good, but it could have been better, and the service was good, but it could have been better. Some high points, and some not so. 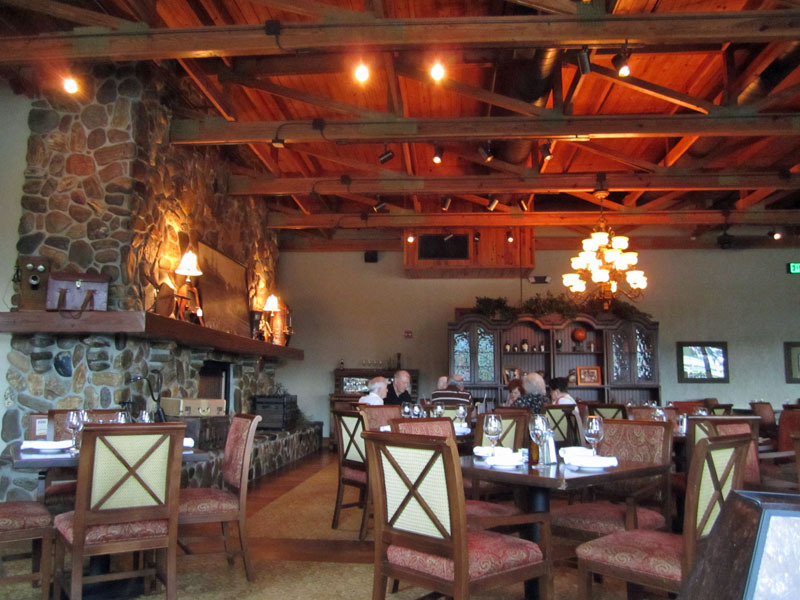 We arrived about dinnertime on a Friday evening and found a beautiful dining rooms, rich and dark with a fireplace and bold furnishings--but it was fairly empty. There were maybe six table or so occupied, and I had to wonder why? It is a gorgeous place, no doubt. We were quickly greeted and quickly seated. In a short time our waitress came out to take our drink orders. We both opted for a glass of wine, a fitting way to end a long work week and kick off the weekend. 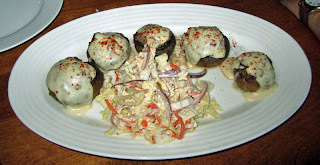 Next we had the Sausage Mushrooms. Large mushroom caps were stuffed with a savory sausage mixture and topped with a creamy cheese sauce. These were OK but just OK. I thought they could have come out a bit hotter. The sausage mixture was just a bit gristly which surprised me, though it had a nice flavor. The cheese sauce was OK. I must add, both this and the other appetizer were garnished with a very nice coleslaw--it had a slightly asian tang to it and was very good. So the Sausage Mushrooms, were OK, just not out of the world great as they could have been. I had a salad to start my meal. 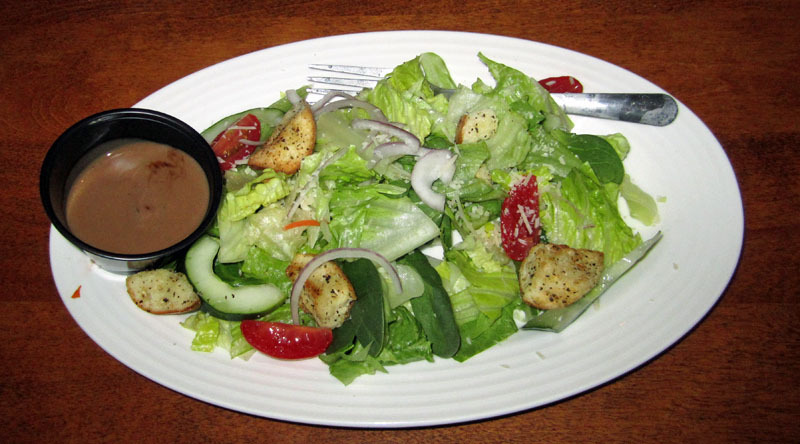 It was a good salad of mixed greens with a bit of cucumber, onions, and a few halved grape tomatoes on it. 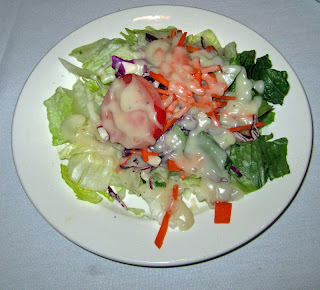 I had a house viniagrette dressing--it was good. One thing I did not quite like, and that was the croutons--they were not very crispy. It was as if they'd not been dried enough. They were just a bit soft and rubbery, not what a good crouton should be. We had not ordered our main dishes until the appetzers came out, but it was a fairly long wait for the main course. Our waitress did come by to apologize for the wait, telling us that the kitchen was a bit slow. I guess when there are only a few other tables, you have to wonder how that can be? It seemed a bit apologetic to me, and she mentioned that they had a lot of new staff. Made me wonder why.... But eventually we did get our main courses. 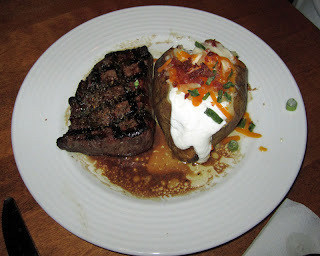 For his main course, my friend Tommy had the Top Sirloin. He ordered it medium rare, but I'd say it came out more medium than rare, just a bit over cooked. And, there was a pool of juice on the plate, a tell-tale sign that it had not rested properly after cooking--perhaps in a rush to get it out, but still.... Still, the steak itself was very tender and moist and juicy and very tasty. And the baked potato was all it should have been. So from a flavor standpoint, this was good. For my main course I had the Grilled Atlantic Salmon. 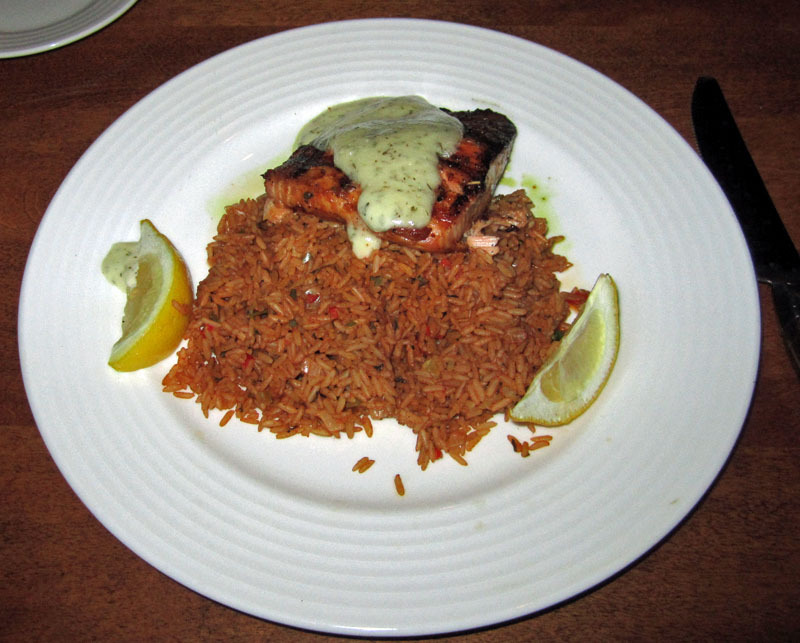 The salmon was cooked very nicely, it had a bit of a glaze/crust on it that was really, really very good, and it was moist and tender and juicy. It was as good a piece of salmon as I've ever had. It was topped with a dill cream sauce that added a nice flavor the salmon. And, the portion was decent, much better than it looks in the picture. For my go-with I had the crab rice, and that was really a disapointment. It wasn't bad, but just wasn't really all that memorable. And I'm not sure what made it "crab" because I didn't taste crab in it. As a matter of fact it was slightly under cooked and there was at least one chunk on the plate that indicated to me that it had been held for some time. After the greatness of the salmon, this was a bit disappointing. So, what are "Włoskie Kanapkę Małe Gryzie?" Well, it is Polish for Italian Sandwich Small Bites. We were recently invited to two parties on one day. Since I love to cook (and make great food), I had to think long and hard about what kind of creation I could bring. But, with the help of my friend, Tommy, I was able to come up with something. I didnt' know what to call them, so decided to give them a Polish name, hence "Włoskie Kanapkę Małe Gryzie" or Italian Sandwich Small Bites, because I used a lot of Italian flavors and meats and made this into some small bites. I started with an Arnold's sandwich round. I opened it up and I toasted it a bit wth a blowtorch. Yes, I said a blowtorch! This got a bit of caramelization on the buns. For a dressing, I caramelized some onions for about an hour on the stove over low heat, just enough to really bring out the sugars in the onions. I then took about 2-3 parts of mayo and added one part of sour cream. To that I added the caramelized onions and some finely chopped, fresh tarragon. I let this side in the refrigerator for a while to marry the flavors. Eventually it was time to make my little sandwiches. To each on I put on some of the "special" mayo, then a layer of thin-sliced radishes, and then a bit of romain lettuce, about two layers. Then I added two slices of genoa salami, a slice of smoked sharp provolone, and two slices of nice and spicy capicoolla. I topped all of this with some alfalfas sprouts and then topped with the other half of the Arnold's round, already slathered with some of the mayo mix. 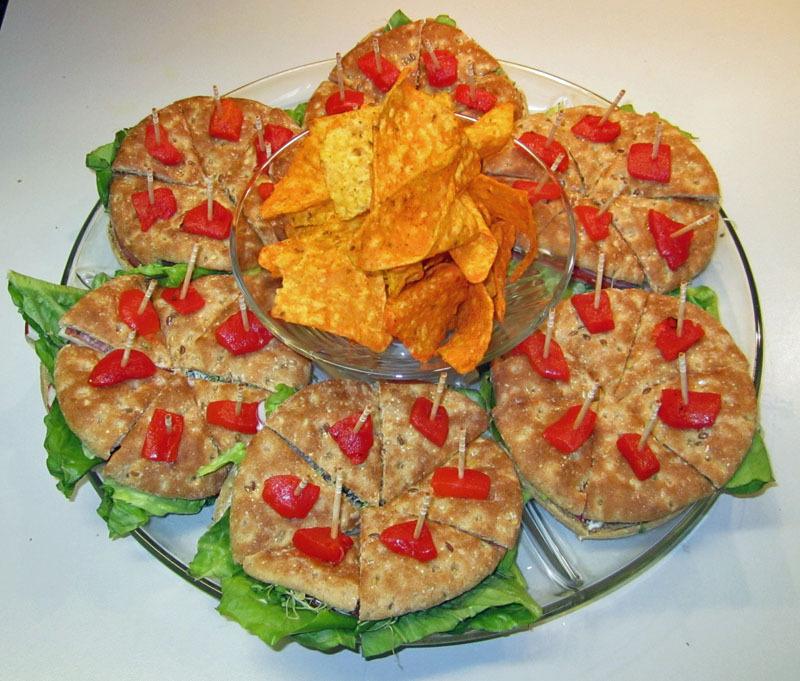 Finally, i topped each one with six pieces of marinated, roasted red peppers, put in toothpics, and sliced into sixths. Then, I just stood back and watched them disappear. Everyone loved them!